My dream is to find a way to save up enough for a Chanticleer gown. If I couldn’t I pray I will be able to get one in a sample sale/end of line sale I would be one of the happiest Brides-2-B around! If you are a Bride-2-B and use twitter you should check out #BrideHour which is every Thursday or #WeddingHour every Wednesday as I have met some wonderful suppliers while participating in these Twitter event. Chanticleer Brides is one of my favourite finds. My heart now belongs to one dress in-particular – ‘Sweet Briar’, however there are others I love nearly as much. I think I’ll be popping to my local stockist later on this year to try this dream gown on. Could you spot the Highstreet dress? Back on one of my favourite topics – High street wedding dresses. Wedding gowns from high street retailers are getting better every year, so much so I bet you couldn’t tell they were from high street retailers at all. Many designer dresses give you a fuller skirt or longer train, but not every bride wants a full skirt or long train, so why pay over £1,000 for a dress just because of the designer tag attached to it? The dress to the right from David’s Bridal collection costs £1,895 and is described as being a “tulle over satin trumpet gown with south detailing and sweep train”, and I don’t think it is worth the price tag when compared to some of the high street dresses on the market. Another high street store that is seriously impressing me with its Bridal Collection is Phase Eight. Phase Eight have been a favourite of mine when it comes to looking for occasion ware for a long time now, as I’ve bought two dresses to wear as a wedding guest and the first time I was engaged my mum bought her MOTB dress from Phase Eight. Phase Eight aren’t going anywhere in my list of favourite formal ware high street shops any time soon as they have now wowed me with their new Bridal Collection for 2015. Phase Eights ‘Hope’ is a dress many brides longing for the designer look would fall in love with. A 20’s inspired gown with heavy embellishment using beads and sequins, featuring a sheer blouson top with a sweetheart lining and embellished waist detail. Styled with a delicate train with finger loop, keyhole back and concealed centre back zip at a steal £595.00 – still at least half the price of a designer version! If you’re worried that perhaps the high street dress may not fit as well as you’d want you can always arrange for a dress maker to do alternations to pinch in more here, shorten the give on the straps etc to make it just right. Even with small alternations done the cost would still be less than the designer alternative. A separate train can be attached at the waist or the shoulder (weaubleau train) depending on the style of your dress. A detachable/separate train attached at the waist could be sewn between the layers of the skirt, or over the top of the skirt. For brides with sewing experience there is help and advice online for how to create a train for your trainless wedding dress yourself, such as here and here. If you are a bride on a budget there has never been a better time to get out on the highstreet for all your wedding needs, including your wedding dress. 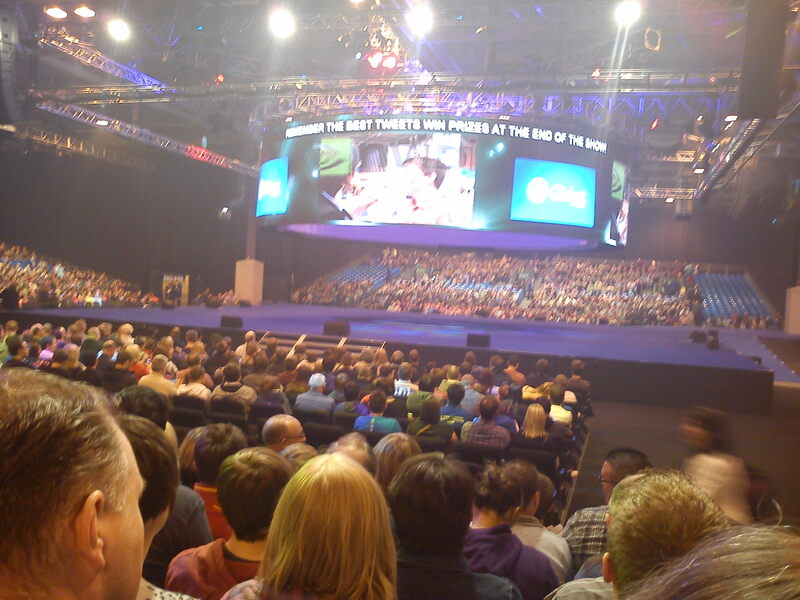 So this year Hubby 2 B and I went to the Gadget Show Live at the NEC in Birmingham. He kept begging me for years to buy him tickets to go see it. So this Christmas I finally did just that; and it was as awsome as it promised to be. If I have a tip for anyone else who is with a geeky guy and wants to go to TGSL book early! The Super Theatre books out early, and when I got to booking the tickets in November the only time that had space left for the Super Theatre was 4.30. We got to the NEC at 9.30 in the morning. The time from then until 13.30 flew by. But at 13.30 we’d been around all the stalls twice and our legs were killing us but we had to wait until 4.30 for the Super Theatre. Which was a pain on our enthusiasm and on our feet. The Super Theatre was worth the wait though! It was awsome, and I would do it all again! 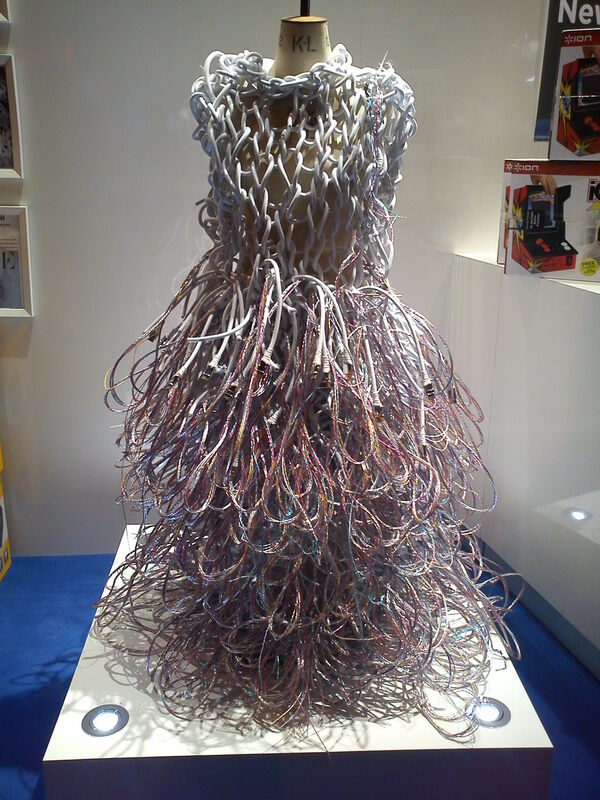 However, while at the GSL I saw something that I think geeky brides2B would have loved as much as I did when I saw it. It was the first wedding related thing in ages that had actually put a smile on the Hubby 2Bs face. It isn’t actually a wedding dress obviously but made to look like one from a distance, then you get closer and it is all wires and cables. What do you think? Pretty Geeky huh?